High Quality Content by WIKIPEDIA articles! 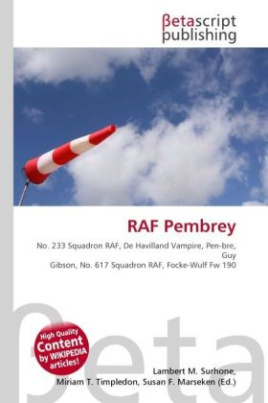 RAF Pembrey was a Royal Air Force station, home to 233 Operational Conversion Unit which flew de Havilland Vampires and Hawker Hunters until its closure in 1957. Site of one of only five Dome Trainer Buildings (for training AA gunners) extant in the UK. During World War II, RAF Pembrey was the base for many of World War II's flying aces including Wing Commander Guy Gibson of Dambusters fame. In 1942 a Focke-Wulf Fw 190 landed there in error after a dog fight over the Bristol Channel. It was captured by the air traffic controller using the only weapon at hand, a very pistol. It is now split into a number of facilities. The Welsh Motor Sports Centre occupies most of the area. The RAF still uses its former station to support the nearby bombing range, known as Pembrey Sands Air Weapons Range. Pembrey Airport remains a working airfield but the short runway retained for this purpose restricts its capacity to small aircraft. However, a scheduled service to London by a nine-seater Britten-Norman Islander aircraft has been proposed. Some commercial retail and storage activity also exists on the site.